Next season is looking really good. I know next year we will “Turn Up”. We have a lot of juniors and seniors returning. I plan to have the best season as a DE in the pelican state. I slacked off last year, but not it is my senior year. It is now or never. My sophomore year was my best year. I had to fight for my position, and I played that position all yer long. My junior year I had to move around a lot which was due to the fact thatwe are a smaller school. My football idol would have to be Julius Peppers. He perfected the position that I wish to master. I started playing when I was 9-years-old for a Flag Football Farmerville Recreational League. I plan on going into Journalism or Physical Education. I either want to write about football or coach it if I can’t play it. DE is my favorite position and really my only position. It is my favorite because it is almost an advantage. A lot of times it is an athletic person vs. a lazy person if you play it right. 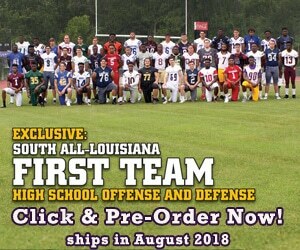 I’d love to play for LSU, Louisiana Tech, or ULM. LSU is my favorite.